One of my favorite parts about the summer is having more time to spend outdoors. Growing up in the northeast, I definitely treasured the increase in temperature and extra hours to play in the sun. 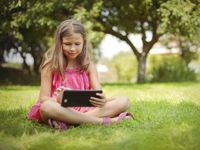 If you find that your children are spending time inside glued to their tablets, they might be surprised to discover that there are plenty of apps to encourage -- and require -- students to get moving outdoors. Here's a list of iPad apps that children can use to explore on their next adventure. This interactive bird guide is perfect for children looking to explore their natural world. Whether they take their iPad with them on their next outdoor adventure or simply study the pictures and sounds of different birds, this app will definitely come in handy. It includes high-quality images as well of descriptions of different birds. If you're visiting a national park this summer, this app from National Geographic is a must-have. In addition to the beautiful pictures that accompany each park guide, there is tons of information from "Park Secrets" to "What to See." This is a fantastic app for families planning an outdoor adventure. This easy-to-use app is a great tool for students exploring the outdoors. You can teach kids navigation skills or how to follow a trail map, or simply give them an opportunity to practice using a not-so-obsolete tool. There are a few different compasses to choose from in the App Store and this one is very straightforward. Children with access to a tablet can definitely bring it with them outdoors. Snapping pictures is easy to do with the camera on the iPad, and iPhoto helps kids take it to the next level. With this app, they can organize their photos, create posters, and even design a layout for their very own picture book. For students looking to gather more information on the trees in their local park or their own backyard, Trees PRO HD is a great iPad app for the outdoors. Kids can look up tons of information, see beautiful pictures, and learn about trees from around the world. This app is a great companion for an outdoor adventure and even has a quiz for kids to test their knowledge. This amazing reading app is full of so much information on the outdoors. It's a perfect choice for kids getting ready for an adventure or for those who simply want to learn more about this biome. Pines to Vines has leveled reading passages, making it a great app for families with kids at different reading levels or mixed-ability classrooms. It's easy to navigate and has engaging interactive features. Children getting ready for a camping trip or just playing outside can practice tying knots with the help of this practical app. Students can learn the steps for making 40 different knots. The clear diagrams include animation demonstrating the right way for making a timber hitch, bowline knot, and more. Have you used an iPad during an outdoor adventure? Share your favorite apps and experiences below!